Karen Witemeyer must have a magical golden pen she's not telling anyone about. 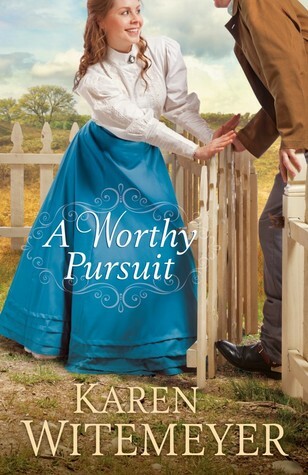 The prose throughout this sophisticated, romantic, Wild West adventure was a treasure trove sure to delight readers. The characters: I fell in love with every single character, except the baddies, but I sure loved hating them! I'm still trying to figure out Karen's secret for creating such real-to-life, masculine heroes. My lands, but this one is swoon-worthy. *blush* His steady, determined pursuit of his love interest as well as his raw honesty and candidness make this leading man one to remember. He's the ultimate, rock hard Wild West hero, but where other novelists have tried to portray him, the effect has been a bit larger than life and too amazing to be real. Not so with Stone. No matter how many baddies he can take down with his impressive skill set, he still bleeds red and has a limit to his invulnerability, which softens the heroine's heart right up. The plot: Alas, my copy of the book fell open to a pivotal scene and I glimpsed a spoiler early on, so I wasn't as surprised by some of the plot twists. But I'm sure others who guard their "first-read eyes" will find the plot to be a rousing page-turner. The setting: Engrossed in the story, I only remembered the overall setting being somewhere in the "West." Probably Texas. Scenes were easily visualized and the important components of "close up" settings were effectively conveyed without encumbering the reader with too many details--a talent within itself. The romance: Oh my. You'll just have to read it. The breaking down of walls comes very naturally but not without pain on both sides. These two hearts have waited a long time to find their match and the hesitance on either side makes the wooing so much sweeter, especially when Stone recognizes the heroine's weakness and makes it his heart's mission to fight through her pain and lead her to healing. *I received a free copy of this book from the publisher in exchange for my honest review.